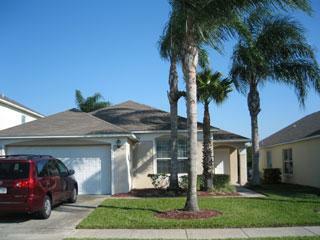 Great 4 bedroom 2 bathrooms in Lake Berkley Resort home, Sleep 8 comfortably, overlooking the lake and Wild Life. The villa is situated within Lake Berkley, Kissimmee, one of the most sought after locations for people wanting to rent a villa. For those visiting Disney it is just 5 miles away--approximately 10 minutes drive. All the other major theme parks are also very close by . For convenience and very cheap shopping there is a 24/7 Wal -mart within walking distance. Additionally the Villa is just half a mile from the 192, where you will find many restaurants, take aways and shops. The Villa itself has one of the premier locations within Lake Berkley, with the sun facing pool overlooking the Lake and its wildlife. The villa is luxuriously furnished and has everything a large family would need including screened pool and spa (can be heated), oversized deck area (great for sun bathing), air conditioning, TV/DVD/VCR/CD player,Playstation 2 leather sofas, fully equipped kitchen, washer and tumble dryer, master bedroom with ensuite, further 3 double size bedrooms. Free calls to anywhere in USA and Canada. 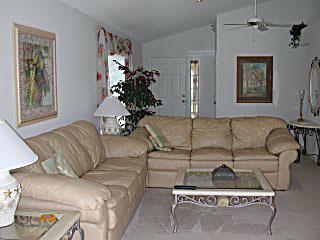 The living area is very spacious and includes 2 large leather sofas The entertainment unit has a 40" Digital Cable TV (over 200 channels), multi region DVD, VCR, ipod docker/player and CD player. The fully fitted kitchen has a large fridge/freezer (with auto ice-maker), dishwasher, microwave, cooker/oven, coffee percolator, etc. There is a separate laundry room with washing machine and tumble drier ---no need to pack your suitcases full of clothes. There are 4 double bedrooms and 2 bathrooms. All have Cable TV, pillows, linen and duvets provided. Bedroom 1 - Master bedroom with queen size bed, Cable TV and en-suite bathroom with shower. ALL bathrooms have shower and hairdryer etc. We provide plenty of towels for your use. The oversized sun facing screened pool has plenty of room for sunbathing. Each side of the pool screen has bushes to ensure your privacy. The pool and outside area have lighting for the evening. The lakeside is only a few yards away where you will see a variety of wildlife. The outdoor dining area comprises of a patio table, 6 chairs and 4 full length loungers , all with with padded cushions. There is also a covered lanai area next to the pool where you can eat outside , or perhaps escape from the sun--or occasional shower. The pool and spa can be heated to 86 degrees. The villa is fully air conditioned and there is central heating for the rare cool winter evening. We provide the services of a management company that will look after any needs you may have during your stay at our luxury villa---they are on call 24hrs 7 days a week.